I have a very heartfelt thank you to send out to Marti who gave me a head’s up regarding this challenge. Thank you Marti! It’s actually been such a long time now since we’ve cooked with cheese that when we accepted the Teese Vegan Cheese Challenge, aside from the usual suspects like pizza and such, it took us a while to think of something to use Teese in. The only request they made was that it not be used in the same old, same old. 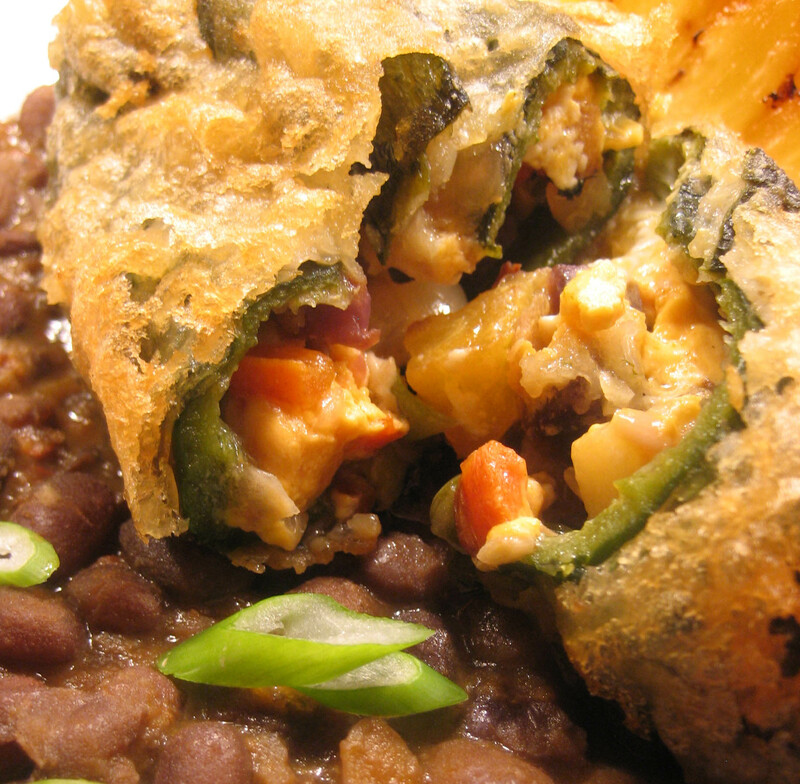 Then it came to us, something we used to love that was both cheesy and special…chile rellenos. The vegan cheese actually worked perfectly in this dish and melted beautifully, which is why you use cheese in recipes to begin with, you want that rich creaminess that enhances both flavor and texture and Teese came through perfectly. In addition to the chile rellenos, I used the mole and filling along with the Teese to make enchiladas. [Using tortillas, roll filling and Teese into enchiladas and place in a baking dish. Cover with mole sauce and bake at 350 degrees, covered, until the Teese and sauce bubble.] Because they both freeze and reheat well for leftovers, enchiladas were a handy way to use the rest of the filling and mole sauce. Remove the seeds and stems from the dried chiles and toast in a dry pan until slightly blackened. Move to a bowl and pour 2 cups steaming water over chiles, cover until softened. Blacken the onion and tomato in a pan and move to a blender. Drizzle some canola oil into the pan and sauté the plantain, garlic and tomatillos until the edges have carmelized. Move to the blender. Add broth, canella, oregano, cocoa and tortillas to the blender and blend until homogenous. Return to a pot on the stove and heat on low for about 15 minutes, season with salt and pepper, set aside. I used both flavors of Teese in this dish because I was sent both flavors to try out and happen to like white cheeses in melty Mexican food. You could certainly use one or the other rather than both in this recipe. Whisk beer into flour until well combined. Sauté the onion and garlic until softened and slightly carmelized, set aside. In same pan, sauté the potatoes and carrot for about 10 minutes and then add in the chayote and sauté until all the vegetables have softened. Add in the grilled nopalito and pineapple. Set aside to cool. Slice the poblanos once to create an opening and gingerly remove the seeds taking care to keep the pepper intact. Insert filling into the pepper with a small amount of the mole and add 1/4 of the cheese [Cheddar and Mozzarella combined]. Close the pepper and stitch together with a wooden skewer. Repeat until all peppers are filled. Dredge in flour and gently knock off excess. Dip into batter and immediately place into heated oil to fry. Fry until golden brown, remove and drain on paper towels. 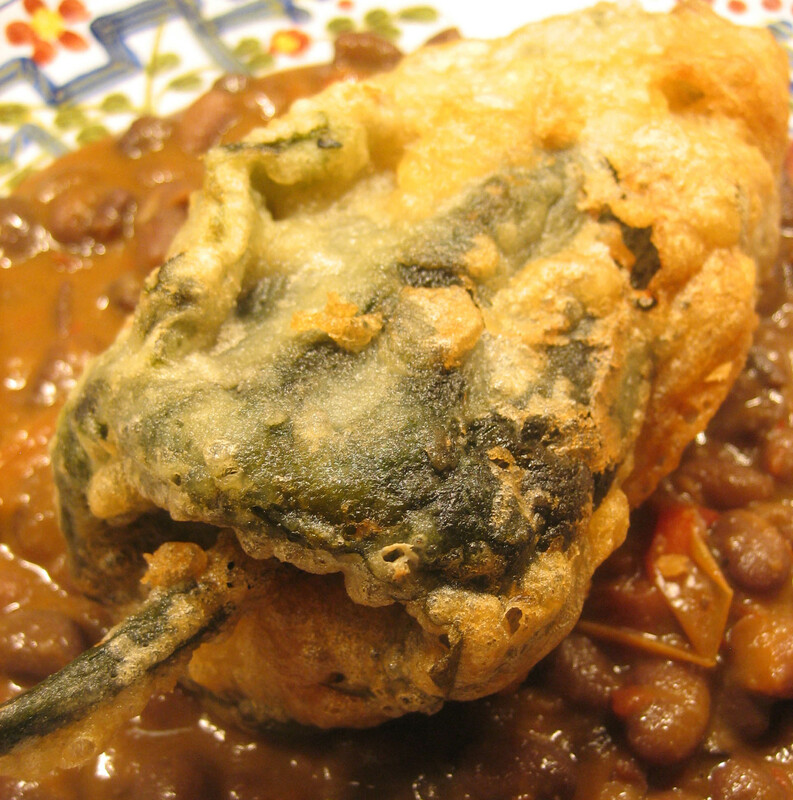 I wanted some richly-flavored black beans to compliment the grilled nopalito and pineapple in the chile rellenos and this is what I came up with. They turned out really well. Remove seeds and stems from dried chiles and toast in a dry pan. Cover with 1 cup steaming water until softened. Add chilis and water along with garlic clove and one tomato to a blender. Blend until smooth and set aside. on February 19, 2010 at 9:26 PM | Reply The Teese Vegan Cheese Challenge! « Go Vegan Go!